On the surface it can be hard to spot the difference between the vast array of steam irons available in the shops, but our latest tests have uncovered a world of difference in the way they perform. If you’ve ever had an iron that’s become less steamy as time goes on, it’s more than likely that limescale is the culprit. We’ve found a huge variation in how well different irons resist this calcified crust. Our latest batch of testing has uncovered two new Best Buy irons that not only stay steamy through months of ironing, but will quickly smooth their way through a pile of crumpled clothes – without making your arms ache. One of these scored so highly that it’s among our highest-scoring irons ever. Another clogged up with scale long before we’d finished testing it, and joins the ranks of our very worst performers. Just want to know which irons top our tests? Go to our Best Buy steam irons. Can you tell a good iron from the price? The short answer is no. We’ve found good-value irons that are Best Buys, as well as expensive irons that score poorly. But although we’ve uncovered a couple of cheap irons that do brilliantly, it’s rare to find a real gem among the budget irons. 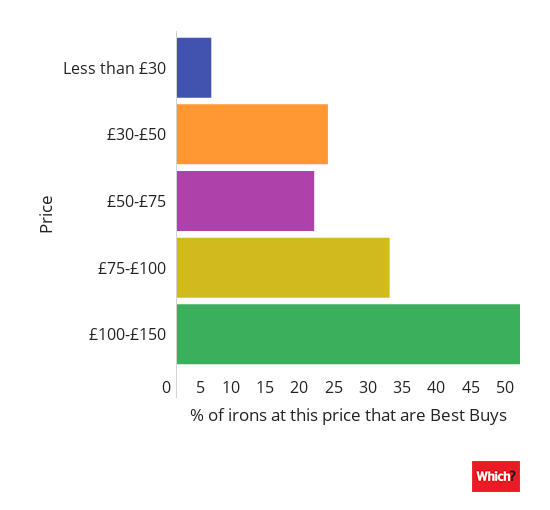 As you can see from our graph, below, of all the irons we’ve tested that cost under £30, only 5% were Best Buys. If you choose a good budget iron, you’ll get quick and effortless ironing for a long time without having to pay a premium for it. However, you will have to live without some of the useful features (such as automatic shut-off or a self-clean button) that you get on pricier models. Don’t want to splash out on an iron? Check out our top five cheap steam irons. A top-performing iron will make light work of creases and remove them quickly. You won’t need to go over the same area too many times or press down too hard – both of which can be tiring and slow you down. Irons with a four- or five-star rating in our ironing performance tests are the ones to choose to make the task easier. Make sure it’s an iron that heats up quickly, and your ironing will get off to a flying start. If your home lacks convenient power sockets, look for a long cord as this will allow you to set up your ironing board where you want it, rather than having to stand right next to the wall or bring out an extension cable. The longest cables we’ve seen are around three metres long – the shortest are about half this length. Live in a hard water area? It’s especially important to pick an iron that scores well for limescale resistance, as it’s the ions in hard water that form scale. Many irons have an integrated anti-scale system – but, as our tests show, not all of these are as effective as they could be, so you can’t assume yours will stay steamy. Our tests simulate three months of ironing, and only the models that stay steamy pass our limescale-resistance assessment. Hate ironing? 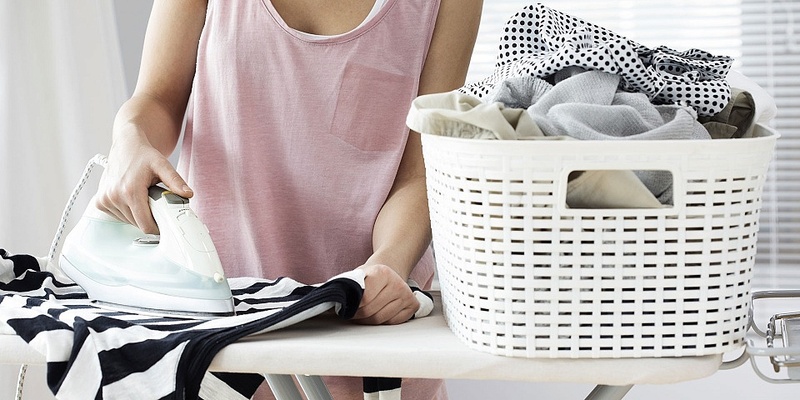 Use our tips to make the whole experience quicker and easier – see how to iron. Are steam generators better than regular irons? If you have plenty of ironing to do, it’s worth considering a steam generator. These have a separate base unit that heats the water and pumps steam through the iron at high pressure, which can help to banish even the deepest creases. Steam can also penetrate several layers of fabric, so you’ll only need to iron one side of a pair of jeans, which should help you speed through that pile of laundry. Another advantage is that, because the water tank is in the base unit, the irons themselves are lightweight, which could be good to know if your arms tire easily. But as generators can cost four or five times more than a regular steam iron, you’ll need to be a keen ironer to get your money’s worth. Bear in mind that steam generators usually take longer to warm up, and are bulkier to store, than regular irons – so they’re less convenient to set up if you need to quickly refresh a shirt before dashing off to an appointment. Read our full, expert steam generator reviews to find out which one of our latest steam generators is a Best Buy. Our expert pick of the top five best steam generators.